Adverbs love to dress up verbs or other adverbs. For example, we might progress from, "He sat down," to, "He hurriedly sat down." Now, we know the manner in which he sat. Since verbs are such integral parts of our everyday language, their modifiers are also multi-faceted. To start, there are five types of adverbs you should familiarize yourself with: adverbs of degree, frequency, manner, place, and time. With these categories under your belt, you'll be well-positioned to identify several different parts of a sentence. This short essay is hardly sufficient. I'm so excited to move to Ireland. I always read a book before bed. Does he normally walk his dog at this time? She usually shops at the Korean market in town. He trimmed the white roses neatly. I combed my dog's fur carefully because it had lots of tangles. There's no reason why you can't discuss the topic with me calmly. 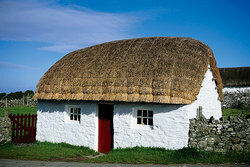 In Ireland, there are thatched-roof cottages everywhere. Clearly, there aren't any leprechauns here. I was so beguiled, I drove into a ditch. Lately, you've been rude to everyone around. They recently relocated to Santa Fe. The morning newspaper arrives daily. Add adverbs… with caution. Sure, they provide us with more information (and information is power). However, if you see a spot where you can opt for one strong verb in lieu of an adverb and a mediocre verb, opt for the singular verb. Otherwise, our writing can become too bulky and cumbersome. Ready to learn some more lists? We've gathered a printable list of 100 adverbs. Perhaps you'll bookmark this page the next time you feel one of your verbs, adjectives, or adverbs needs a little accessorizing. In Ireland, there are thatched roof cottages everywhere. "Types of Adverbs." YourDictionary, n.d. Web. 25 April 2019. <https://grammar.yourdictionary.com/grammar/adverbs/types-of-adverbs.html>. Adverbs love to dress up verbs or other adverbs. For example, we might progress from, “He sat down,” to, “He hurriedly sat down.” Now, we know the manner in which he sat. Since verbs are such integral parts of our everyday language, their modifiers are also multi-faceted.To start, there are five types of adverbs you should familiarize yourself with: adverbs of degree, frequency, manner, place, and time. With these categories under your belt, you’ll be well-positioned to identify several different parts of a sentence.